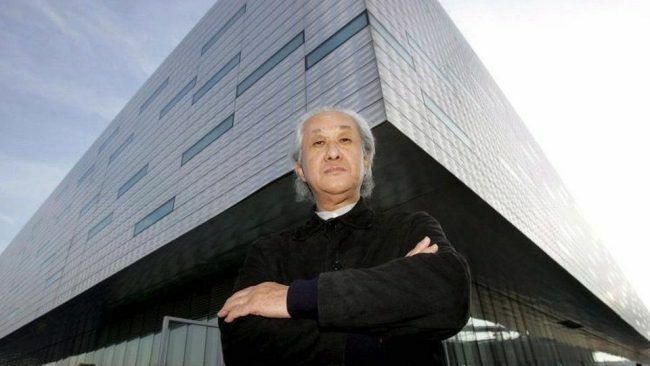 Japanese architect Arata Isozaki was awarded the 2019 Pritzker Prize, considered to be the “Nobel of Architecture”. Eclectic, playful and one of the first international Japanese architects, he has designed more than 100 buildings over his six-decades-long career. We will tell you everything you need to know about him! Arata Isozaki was born 23 July 1931 in Oita, in the South of Japan. In 1954, he graduated from the University of Tokyo in Architecture and Engineering. After his graduation, he worked with his former professor, Kenzo Tange, the famous Japanese architect who received the 1987 Pritzker Prize. Arata Isozaki established his own firm in 1963. His first real experience of architecture was as a young boy. He was fourteen when the nuclear bomb struck Hiroshima. Only barracks and ruins surrounded him, and he started reflecting on how people could rebuild. Thus, the first years of his careers were dedicated to rebuilding a bomb-stricken Japan after World War II. Most of his first works were in Oita, his hometown. However, he then proceeded to travel around the world and was one of the first Japanese architect to design abroad. He is today one of the most influential Japanese architects and has built on five continents. It is worth noticing that this heterogeneousness is also rooted in a will to design a project as part of a wider context. “My identity is that every time I like to create a difference. Not in one single style, but also always according to the situation, according to the environment; an architectural style as a solution.” Arata Isozaki said. “Every time it’s different”. Holistic architecture could be defined as an architecture considering everything that surrounds the project: the environment, the town’s culture, local architectural skills and so on. As the jury states: “His architecture rests on profound understanding, not only of architecture but also of philosophy, history, theory and culture”. The Japanese architect’s adaptiveness made him use intercontinental range of building techniques. “He has brought together East and West, not through mimicry or as a collage, but through the forging of new paths” the Jury says about him. Thus, his architecture is international in the sense that he also encompasses local differences and constraints. Even though he has worked on various projects abroad, some Japanese concepts are central to him. And especially the concept of “ma” (= the merging of time and space), the art of space, is important in his architecture. Indeed, he stated: “In-between space, sound and sound, there are silences apart, pauses. That’s called Ma. Space is important; in-between space is more important”. He has signed more than 100 buildings during his career, including some in Spain! Here is a selection of 5 of his most famous projects. This was Arata Isozaki’s first work outside of Japan and critics received it very well. This museum is mostly underground and clad in red sandstone, which makes it stand out. 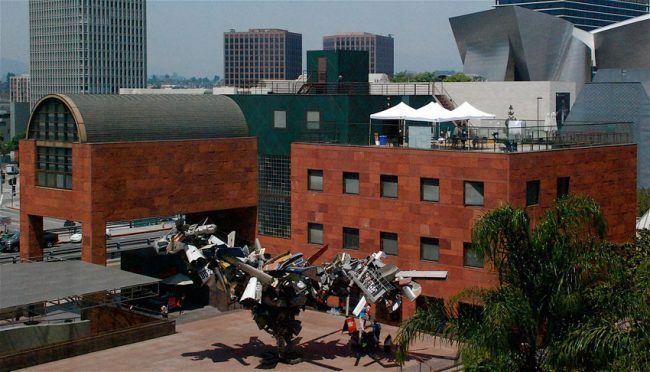 It is an arts complex with a theatre, a concert hall and a contemporary art gallery. The emblematic metal helix tower is 100m high. This park was inspired by traditional Japanese architecture. 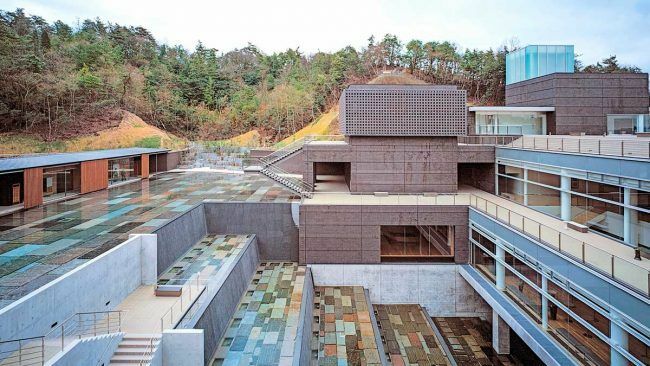 Arata Isozaki also chose stones of various colours for the outside to show the different clays that can be found in the Gifu Prefecture. 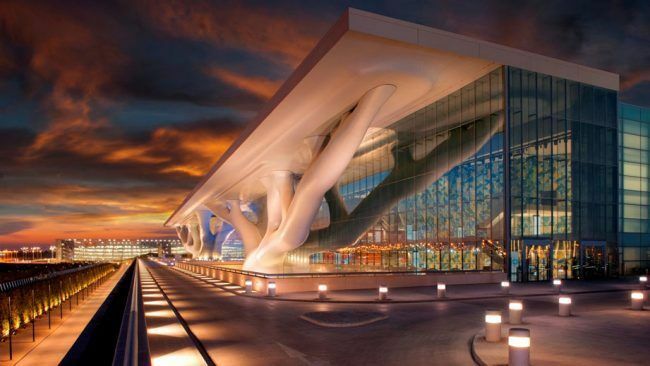 The Qatar National Convention Centre in Doha is the largest exhibition centre in the Middle East. Colossal tree-like columns seem to be supporting the roof of this sustainable building. This inflatable mobile concert hall is a collaboration with Indian sculptor Anish Kapoor. It was designed to tour regions that were affected by natural disasters and can hold up to 700 people. Other buildings in Spain include the Domus: Casa del Hombre Museum in A Coruña, Isozaki Atea in Bilbao, access to the Centro Cultural Caixa Forum and Palau Sant Jordi in Barcelona, and the tenth floor of the Hotel Puerta de América in Madrid, a collaborative work with several famous architects (Norman Foster, Zaha Hadid, Jean Nouvel, David Chipperfield…).